1. Not all S-Level uses are equivalent – some have a path leading to AMR from them, others not. Many of the S-level uses encouraged in these cautious scenarios are dead ends as far as building upon them goes. In other words, these types of uses do not set the stage for anything to happen beyond them. For instance, consider the S-level use of online multiple choice tests to replace their paper counterparts for summative assessment. Absent any serious fine-grained learning analytics tools (sadly, truly hard to find), nothing builds upon this: the student takes the exam, then gets a grade, just as they did before, and nothing new can be built because of or on top of this. By contrast, using the same toolset for in-class fast formative assessment (e.g. as in Eric Mazur’s ConcepTests1) sets the stage for technology use at the A level and beyond, with remarkable improvements in learning outcomes via peer discussion and peer instruction. As always when thinking about SAMR, the technology is only one piece of the puzzle – what happens with it is just as crucial. 2. When going from Substitution to Augmentation, the previous effectiveness of use (and/or understanding of the whys of that use) of the technology being replaced is crucial to the transition occurring. At the A level, the new technology brings with it functional improvements that could not be accomplished with the old technology. However, if the old technology was deployed in such a way that some of its S-level features were misused or underused, then this may thwart the use of A-level features in the new technology. For instance, any good ebook or PDF reader has built into it annotation and highlighting features (S level – these are present in any paper book accompanied by a pencil and highlighter), as well as automated note summarization, gathering, review, and export features (A level – paper books can’t collate and export highlights and notes by themselves). However, in many schools students are forbidden from highlighting or annotating textbooks, since the books will be reused over multiple years. This should not pose a problem – it simply means that students will also need to learn to highlight/annotate when using ebooks – but in practice the previous state of things prevails, specially if it is perceived as having worked “well enough”. In the very worst cases, students wind up trying to improvise highlighting strategies that result in ebooks that are a sea of yellow text, and the automated review features of the ebook wind up doing more harm than good. 3. The overall outcome of a set of S-level practices is a net zero (or very close to it) improvement in student outcomes. Some of these practices will have a slightly positive impact, while others will have a slightly negative impact – but the slightly negative outcomes will be perceived as weighing much more than the slightly positive ones, with the corresponding expected impact upon the survival of the project. As you can see, the median for S-level use in these studies is very close to a zero effect size – we’ll analyze the effect sizes for AMR in a later chapter. However, while this is the reality of the situation, the cumulative perception is a very different thing: every (very slightly) negative outcome will be perceived as being up to twice as large as it actually is, and the perceived net result will be overall negative. Argue all you like with the perception – the bottom line is that your project is headed at this point to either a slowdown (which will only make matters worse) or the chopping block. So, what is to be done? You could, of course, just say “make sure to not stay at S for too long”, and call it a day – but if things were that easy, I would not be writing this book. It is important to note that the school leadership and teachers that I have met over the years are neither thoughtless nor foolish – most of the schools I have seen fall into the “all S” prudence trap are staffed by genuinely caring and engaged individuals – but that makes their dilemma no less real. 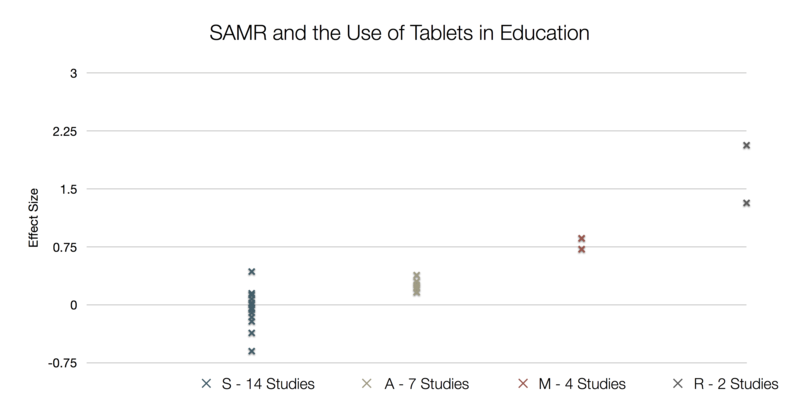 Because of this, over the past few years I have developed a particular approach to SAMR and its use in planning and implementing new technology uses in education that avoids this trap, and still manages to fit within the bounds of reasonable prudence. The approach is not prescriptive – many schools have been successful with very different modes of development and use of SAMR – but I believe it can provide useful food for thought at risk-taking and risk-avoiding institutions alike. The first stage in this approach is to develop a carefully selected core of shared practices among teaching staff – but before we look at how to do this, it will be useful to review SAMR and a second model, the EdTech Quintet. Which will be the subject of the next chapter. Over the past fifteen years, I’ve had the good fortune of working with many people who have found SAMR a useful and helpful tool in their work. Over the same period of time, I’ve given quite a bit of thought to writing a book on SAMR and the EdTech Quintet, so as to share both models and their applications with a wider audience. Despite having created several drafts of such a book, I’ve always found a challenge in answering a simple question: what would make it special, and not just a restatement of what I’ve said elsewhere? After all, videos of my sessions are readily and freely available online, as well as all of the corresponding slides and other accompanying materials. Some of my research work over these fifteen years has provided me with an answer. I’ve seen many successful and wonderful projects – but, unfortunately, I’ve also seen projects that never really take off, despite good availability of technology and technical support. In particular, I’ve seen projects that fail, not due to an excess of ambition, but rather due to an excess of caution. These projects are characterized by too gradual an approach, staying with Substitution-level uses almost exclusively during the initial phases, and failing to justify the time and resources used in the years beyond. Just presenting SAMR by itself does not help here: something more is needed, a solid scaffold that allows schools to incorporate Augmentation-level (and beyond) uses quickly, so that the project does not stagnate and fail in its early phases. The good news is that an approach that I’ve been testing over the past few years does just this – and this will then become the reason and subject of the book. What should computational thinking be about – and why should we care? The role of mobility today: revisiting the Lively Sketchbook and the Curiosity Amplifier. Architectural Redefinition: SAMR as a tool for designing learning spaces. One final note: I have always made a point of making my slides and videos freely available and distributable under a Creative Commons BY-NC-SA license. That won’t change here: all of these blog posts are, and will remain under the same license. It is too important to me that as many people as possible have access to what I hope is useful information, rather than closing it off under lock and key.